A sharp tumble in the value of the ruble has prompted some Russian real estate investors to try to break their American real estate contracts. New York-based lawyer Marlen Kruzhkov has seen a surge in the number of Russians seeking to flip their real estate contracts. Many of the properties are second and third homes for the Russian buyers. These properties stopped being a priority for purchase after the value of their money plummeted to the point where the deals could not be closed. “An apartment in Miami, even the most glorious beachfront apartment, is not a priority right now,” Kruzhkov said. Russians have also canceled deals in New York, with investors looking to escape contracts in the negotiation phase. “I have had Russian clients who were about to purchase properties in New York change their minds within days of Russia occupying Ukraine,” Petro Zinkovetsky, a lawyer, told the Observer. He said one of the buyers was in the process of purchasing a $10 million home, and another was seeking to spend $17 million. Economic sanctions and falling oil prices have put the ruble in a dramatic tailspin, which has left Russian billionaires scrambling. Viktor Vekselberg, Gennady Timchenko and Alisher Usmanov, along with another 17 of the nation’s wealthiest people, lost a combined $10 billion in the week leading up to the holidays, Bloomberg News reports. The fall is largely associated with crude plunging to a five-year low following the United Arab Emirates announcement that OPEC won’t rein in production. This resulted in Russia’s central bank raising its benchmark interest rate overnight to 17 percent from 10.5 percent on Dec. 15. “The optimists who thought in March that everything would be all right in the end now understand that nothing will be OK,” Stanislav Belkovsky told Bloomberg News. Belkovsky is a Kremlin adviser in Vladimir Putin’s first term and is now a consultant for Moscow’s Institute for National Strategy, a research firm. While economic hardships may cause average American homeowners to foreclose their sole properties, wealthy Russian investors — who typically operate in the $5 million to $15 million range, according to Kruzhkov — tend to switch to less expensive apartments in busy downtown lofts. These are easier to rent out. Sales of U.S. homes to foreign buyers rose to an estimated $92.2 billion in 2013, the highest sales volume in at least four years, according to the most recent annual report from the National Association of Realtors. 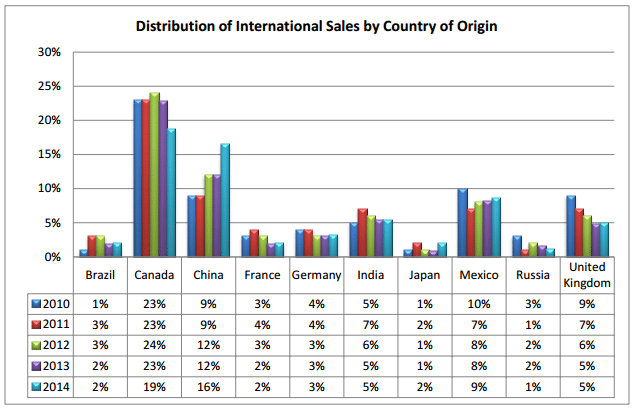 Most overseas buyers were from Canada, China, Mexico, India and the United Kingdom, which together accounted for 54 percent of international sales. Russian buyers have accounted for 1 to 3 percent of international sales in recent years, NAR reported.